It’s hard to believe that it’s been three years. We miss you Marley. I still feel so privileged to have known you, and to continue to have you with me as I write these books. 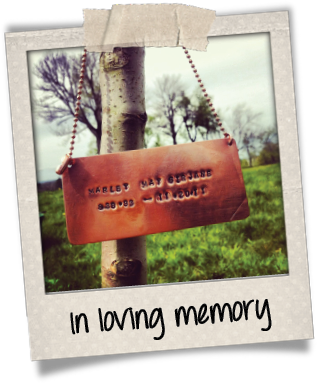 I wanted to release Dream On today, in Marley’s memory, but unfortunately it’s not quite ready yet. So as a compromise, I’ve uploaded the first chapter here in PDF format. Click the link to read it, and let me know what you thought in the comments. 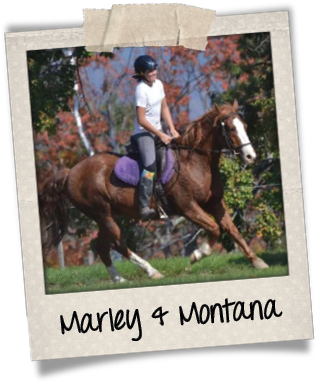 I met Marley Sirjane at summer camp in NH, USA, where I worked for five summers between 2004 and 2010. Marley, like many of the girls who came to the farm at the end of the road, was a regular fixture, returning year after year. Each year she was a little taller, a little older, but little else changed. She always had a boundless enthusiasm for getting the most out of life, and loved her time there. Always surrounded by friends, always with that magic smile on her face that never failed to light up the room. Part of my role at the camp was to help with camper/horse assignments. Each camper was assigned a horse to ride each week, and one by one they would come to me and tell me which horse they wanted to ride. There were always perennial favourites, and there were always a few that not many people wanted to ride. Montana, affectionately known as Monty (or Monster), has always been one of the latter. A stocky chestnut mustang, he’s a stunning and extremely intelligent horse that was assigned to very few riders, due to his difficult and unpredictable nature. He had come to the farm after our director had seen him tied to a post in someone’s yard without any food or water. The story goes that he’d belonged to a young woman who’d left him behind when she left her boyfriend, and so he’d been abandoned. Never one to let a horse suffer, Tom bought Montana and took him back to the farm. Even if he’d known then how difficult Montana would end up being, I don’t think he’d have done anything differently that day. Montana is a horse that chooses his riders – no matter how skilled or experienced you might be, if he doesn’t like you, you don’t have a hope of getting any constructive work out of him. He was never an easy horse to assign, and would regularly be left in the feedlot unridden if nobody suitable was available for him. As one of the most advanced rides on the farm, he was sought after by the experienced riders looking for a challenge, but over the years there have only been a few people who really ‘clicked’ with him. Marley was one of them. I was not. 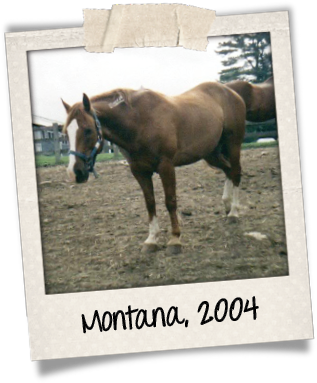 I rode Montana three times, back in 2004. The first time was one sunny afternoon in the advanced ring, and he was an angel. Extremely quick to pick up new ideas, he tried hard to do as I asked and his canter was the smoothest, most comfortable I’ve ever had the joy of sitting on. His proud bearing and sensitivity made him an extraordinary horse to ride, and I still treasure the memory of that day. What I don’t treasure were the next two rides I had on him. Both times taking him out on trail, with a group of riders behind me. The first time he was almost foot-perfect, only getting a little hot coming home, but I made myself stay relaxed and sang songs to him as we returned to camp. I’ve never been a particularly brave rider, and Montana is an extremely powerful and strong horse. As much as I liked him, I was becoming slightly nervous of him, and I knew that I couldn’t afford to be, for either of our sakes. Our next ride was problematic. He got upset, and his anxiousness transmitted itself to me. Unable to calm myself down sufficiently to give him the reassurance he needed, I eventually dismounted and led him home. One of my fellow counselors had spent many weeks that summer training him and getting his confidence back after a nasty accident the summer before, and I didn’t want to upset him any more than he already was. As I walked him home, I apologised for not being able to be there for him and give him what he needed. I felt a slight disconnect from him then, as though he pulled away from me a little, and I never rode him again. It was by choice, because I don’t think it’s fair on a horse who need so much reassurance and confidence from his rider to not be able to have it, but I still always liked him, and regarded him fondly. 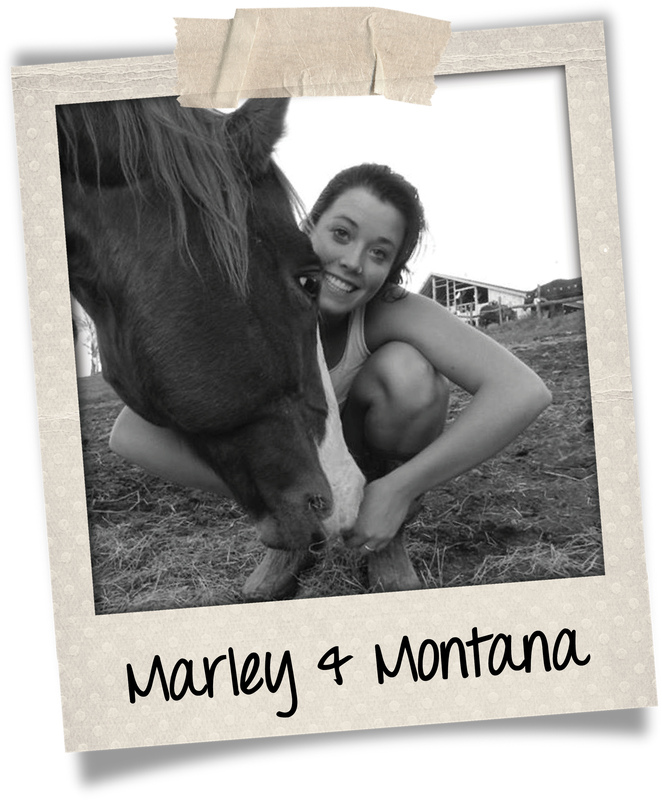 But Marley was one of the riders who could handle Montana. She never became flustered by him, even on his bad days, when he would panic and just canter endless circles of ever increasing speed. She never got mad at him, or asked him why he couldn’t be more like the other horses. She accepted him for who he was, helped him through his difficult times, and loved him unconditionally. And every time she rode him, the bond between them increased. She became one of his special people that he trusted, and there are precious few of them in his world. When it came to writing Dream On, it was this bond between horse and rider that I wanted to capture. In some ways, Dream On is even more Marley’s story than Dare to Dream was. In that book, Marley and Cruise have a powerful bond from the very start. There is no baggage with Cruise, no trauma in his past to get through, no trust issues to deal with. They have a connection almost like telepathy, and they understand and relate to one another from day one. I’ve had that kind of relationship with a horse, and it’s a magical thing to experience. But that story has been told, and it was time to look at a different type of relationship. One that has to build that foundation. One with a horse that has been through so much that she can’t bring herself to trust people again – and a rider who has to learn how to allow herself to share the love she has within her with others. 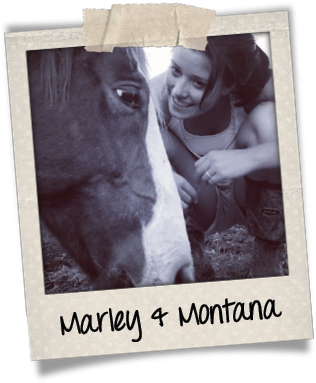 Although Marley (the character) has always been her own person, the strength of Marley Sirjane’s bond with Montana came back to me time and again as I wrote this next book. I hope that my words can do their relationship justice. 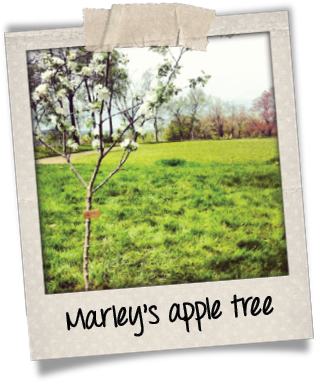 There is now an apple tree planted next to the main riding ring at the camp, in Marley’s memory. I’ve heard it said that when Montana first returned to the ring after the tree was planted, he stood and stared at it for a long time. Everyone waited with tears in their eyes until he finally walked on. Maybe he was reacting to the sight of a new tree, although none of the other horses were overly bothered by it – but he has always been more sensitive than most. Or maybe he knew, somehow, what that tree means. Maybe he was saying goodbye too. It’s a special place, underneath that tree. When I went back to the farm for the first time after Marley’s passing, I went up there and sat with her as the sun went down. The sky slowly turned pink above us, and I thanked her for coming along on the journey while I wrote “Dare to Dream” – I had just given her mother the first draft of the completed book to read. Then we sat in silence for some time, before a huge flock of birds came overhead. They swooped and turned and flew back and forth in perfect, chaotic formation, and then all of a sudden, as one, disappeared into the woods. I brushed away my tears and as I got up to leave, I reminded Marley of what our camp directors always told the girls who didn’t want to go home just yet, who weren’t ready to leave the farm behind. See ya round, Marley May.